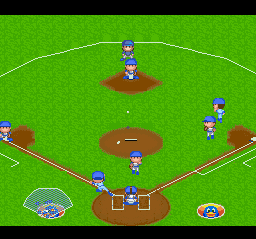 Remember the Baseball Simulator games? The first one appeared on the 8-bit Nintendo and was developed by Culture Brain in the year 1989. 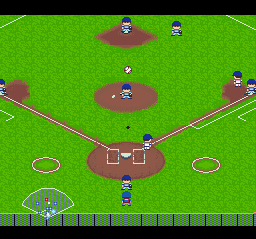 Two years later, Super Baseball Simulator 1.000 was released on the Super Nintendo. It’s had something of a quasi-cult following ever since. 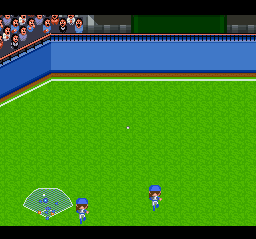 It was a baseball game, sure, but it incorporated “magic tricks” to make the game a little spicier than your average baseball title. 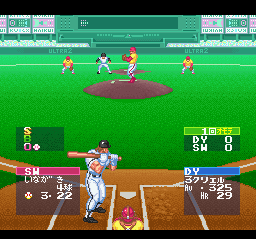 Pro Yakyuu Star is the sixth and final Culture Brain SNES baseball game, and I dare say it’s the finest one of the (sand)lot. Let’s take a quick history lesson though before we take a closer look at Culture Brain’s baseball swan song. Every franchise has to start somewhere. This is it. 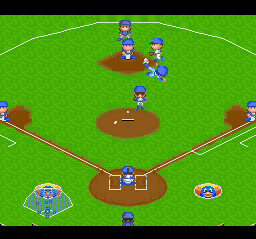 Don’t recall playing this myself (I was more into Baseball Stars 2, Base Wars and Bad News Baseball) but I recall a few friends who were fans of this game back in the day. Arriving during the infancy of the Super Nintendo, this developed something of a semi-cult following. 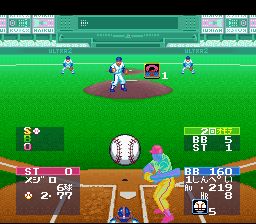 It was baseball spruced up with gimmicks like magic trick pitches and the like. 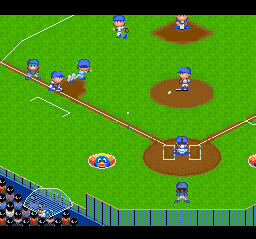 It brought a little extra spice to the standard baseball simulations that flooded the market at the time, so it deserves props at the very least for being different. 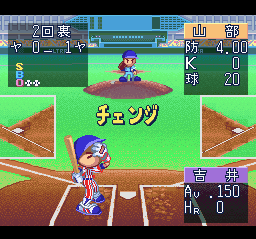 Culture Brain launched a new baseball series with this game, which only came out for the Super Famicom. 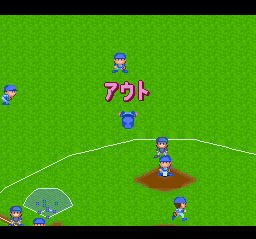 Think of it as Super Baseball Simulator 1.000 but with real Japanese ball players and improved visuals. It retains all the crazy Ultra Plays. 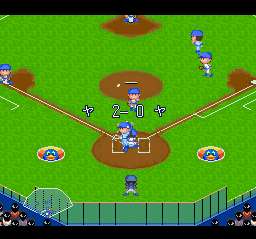 Super Ultra Baseball 2 is the sequel to Super Baseball Simulator 1.000. Released three years later, this is most evident by its beefed up visuals. Never thought I’d say a baseball game looks pretty but this one sure does. All your favorite Ultra Plays are back. Some Japanese to navigate through but definitely a worthy sequel. 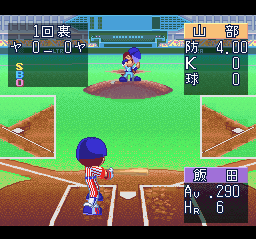 Culture Brain didn’t wait even five months after Super Ultra Baseball 2 (July 28, 1994) to release Ultra Baseball Jitsumeiban 2 (December 22, 1994). 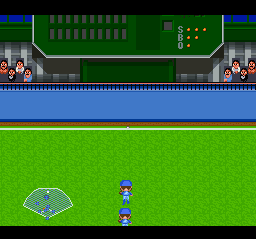 I really like the super deformed route they took here. 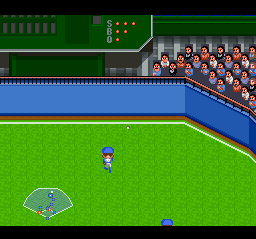 There is something charming about an old school 16-bit title featuring slightly deformed ball players. Also, Ultra Plays are still here. The best of the Jitsumeiban series. Culture Brain released their fifth game in the SNES series, Ultra Baseball Jitsumeiban 3, on October 27, 1995. 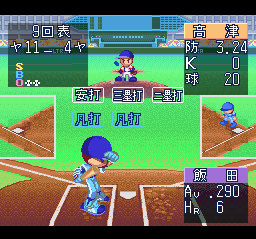 As you will see, it features the visuals that Culture Brain would go on to use in Pro Yakyuu Star. 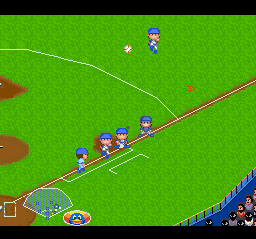 Culture Brain took an entire year off to work on this game (no baseball titles released in 1996) and the effort shows. Although the Ultra Plays are gone, I like the feel of this game a lot. And hey, you’ll always have the five other games if you’re adamant on using Ultra Plays. One of my pet peeves with these vintage baseball games is that more times than not, outfielders can’t throw for jack squat. 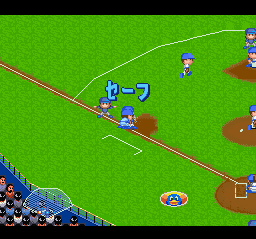 The ball ends up rolling to second base or bouncing several times to home plate. It completely ruins the fun of the game but thankfully in Pro Yakyuu Star these professional baseball players are actually, you know, well trained pros! Imagine that! 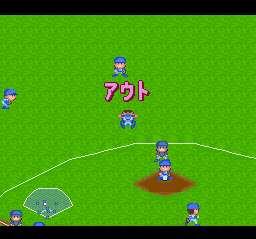 Speaking of being pros, I also like the numerous nice defensive stops you can do. Take for instance this diving catch in which the defender ends up rolling around for a bit. 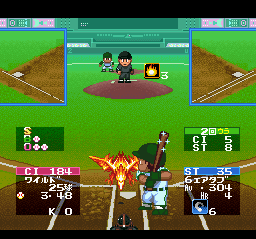 It’s a small detail but points to the level of craftsmanship Culture Brain was able to achieve after five previous SNES baseball outings. Whatever you do, don’t let the ball roll to the gap. D’OH! You only missed it by… 15 feet! Other than a home run, one of my favorite sights in a baseball game is seeing the ball smacked all the way to the outfield wall. 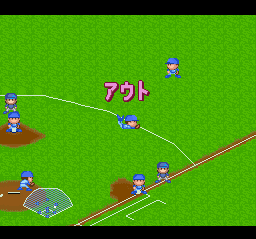 And then rounding the bases as madly as I can while watching the defenders give chase. Good stuff. 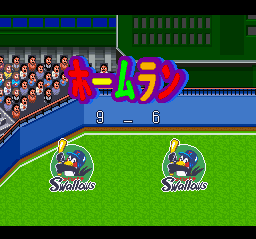 Speaking of satisfying, how about a good old bloop single or double down the left or right field line, just barely inside the foul line? 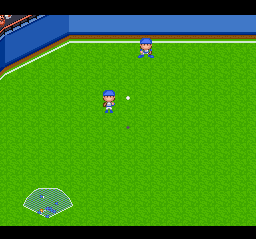 It’s a great feeling to see that white baseball find a vacant spot on that beautiful grassy outfield, just outside a defender’s reach. Sliding home safely just before the tag is the best. Swiping second base feels so good. 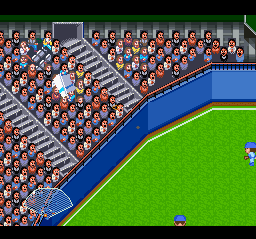 Some baseball games don’t let you steal. Either your runner is too slow or the catcher’s arm is too strong. Culture Brain seems to have struck a fair balance here. 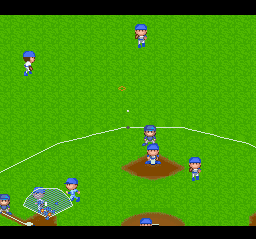 The running game comes into play a bit more here than in other 16-bit baseball games. 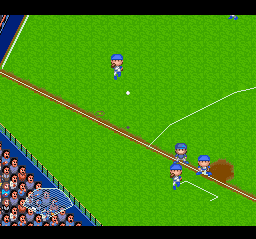 Hell, a fast runner can even swipe third base, which was near impossible for most games from that era. Rickey Henderson would be proud. 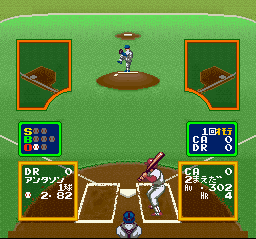 After stealing second, I’m off stealing third. NO MERCY! Gotta love the cloud of dirt and dust that gets kicked up as you slide in for the steal. Those are some of the angriest fans I’ve ever seen! Attention to detail is on point. 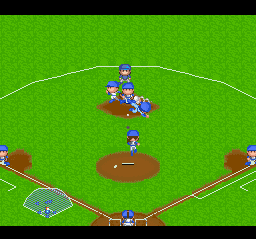 Look at the batter digging his cleats into the soft dirt. 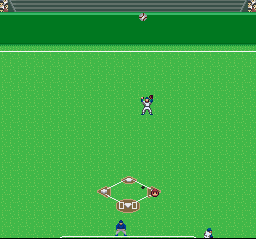 In the other shot we see the anguish of a batter who just struck out. Somewhere Patrick Stewart is smiling. 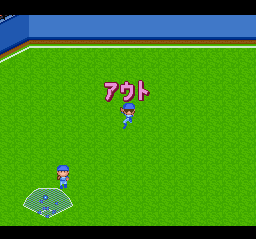 Speaking of attention to detail, I love how the pitcher sometimes will react with an exclamation mark if the ball is hit particularly hard. It doesn’t always result in a home run or even a hit, but just like in real life sometimes you hear the crack of the bat and you go uh oh. 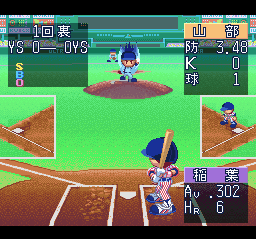 Although I like Super Ultra Baseball 2 and Ultra Baseball Jitsumeiban 2 a lot, Pro Yakyuu Star probably does play the best of the (sand)lot. However, it’s missing the wacky Ultra Plays and when it comes down to it, the gap in sheer playability is not wide enough for me to prefer playing those games instead. This was Culture Brain’s final baseball game. 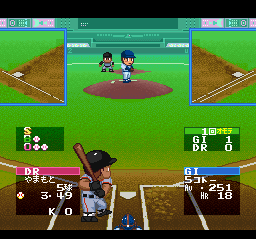 They were planning to release Shin Choujin Ultra Baseball and Choujin Ultra Baseball for the Game Boy Advance but that was cancelled. 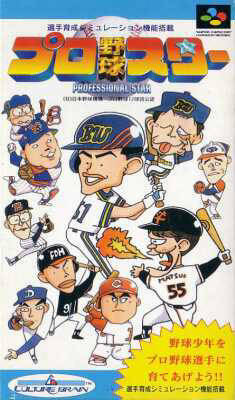 Also of worthy note is that they chose to make Pro Yakyuu Star its own stand alone entity rather than Super Ultra Baseball 3 or Ultra Baseball Jitsumeiban 4. 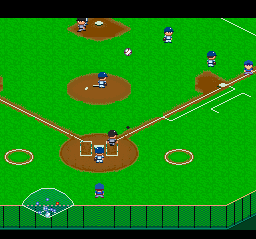 It’s kind of neat to see how the Baseball Simulator series started and ended here more or less. 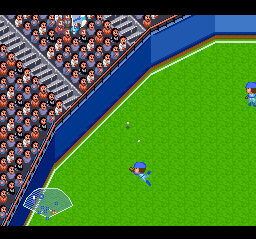 These quirky baseball games deserve a little more recognition. I hope this gives you a few new intriguing oddities to try out for yourself.